Thanks to my friend Jeff who sent over this clip from Adam-12. In this 1974 episode of Jack Webb’s Dragnet spin-off, Martin Milner and Kent McCord are sent to investigate an urgent parking emergency at the Tail o’ The Pup. I love that glamorous Touch Of Evil tracking shot across the front of the restaurant and wish it had continued all the way down La Cienega. The wiener-shaped landmark has been in hiding since a never-built condo development sent it into storage eight years ago. Owner Eddie Blake is said to be entertaining offers to relocate the novelty restaurant. 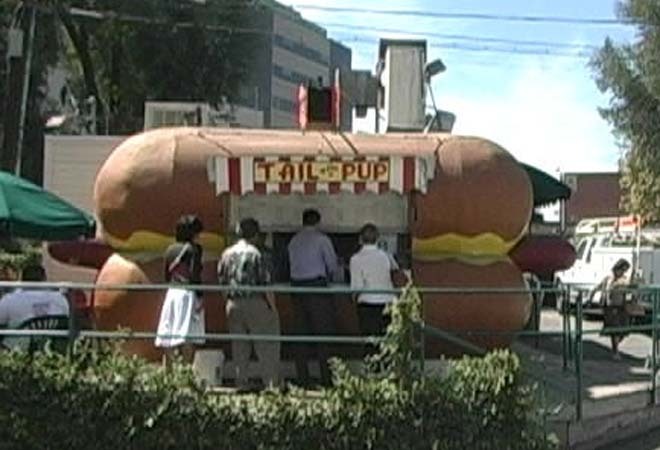 Where would you like to see the pup pop up? Previous articleHow Does Your Garden Grow, Willie Jane?